Salon luxury exists in stages, and a new concept and salon may have found its absolute peak. 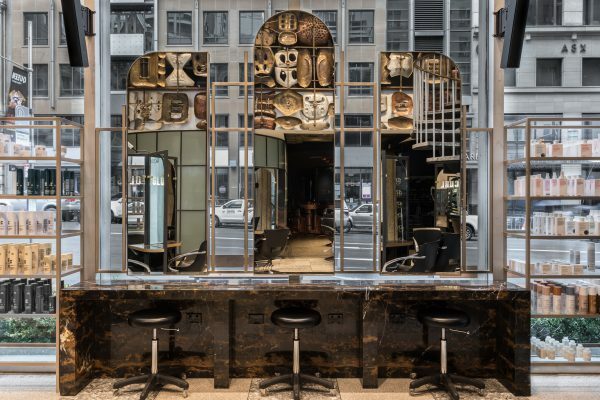 Created by celebrity hair stylist Christopher Hanna, this self-titled salon in Sydney has exceeded all expectations of grandeur by combining hair and beauty with a contemporary late night lounge. 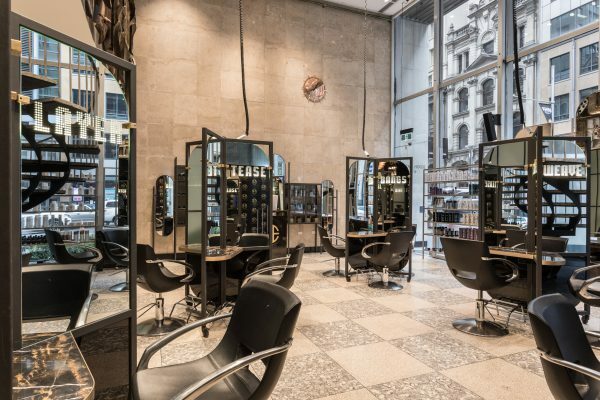 Christopher Hanna’s anticipated flagship salon now graces the streets of the Sydney CBD, and his clients are drinking it up – literally. Champagne flows and espresso martinis – which reside on tap – float into the hands of content salon clientele. It is Christopher Hanna’s most opulent creation yet. The host building, a historic haven situated conveniently at Bridge and George Streets, features classic 1959 architecture with a stunning glass entry that, integrated so well, may be missed if walking too briskly. Upon entering, the world-class salon staff immediately welcomes and leads the guest to their seat to begin a unique salon experience. An extensive list of handmade cocktails, coffees and teas, and not to mention a delicious food menu, all await as the in-house mixologists prepare to serve clients chair-side. While getting settled, the client’s hair is then treated with all of Christopher Hanna’s famous salon quality. The APM skin and hair analysis system provides an image of the hair and scalp to help better understand all hair needs, whether it be hydrating treatments or scalp care. They can then offer a tailored treatment, and at the next appointment provide a follow-up image to show your real progress. When ready for cleansing, a spiraling staircase leads to a row of modern black basins, each with accompanying leather massage chairs. The sleek style evokes a spa-like aesthetic of pure relaxation while clients receive a treatment. Despite the complexity of the space, the new Christopher Hanna salon has succeeded in helping their clients to feel welcome and cared for which is owed to their personalised treatments and service. Between the salon and famous copper bar and lounge room are three uniquely designed but equally professional beauty rooms where clients can receive a number of cosmetic treatments. The rooms and professional staff allow for the option of light therapy, nonsurgical skin tightening, laser treatments and the latest in fillers and injectables. Clients can even receive facial diagnostics by Skin Seuticals to hone in on problem areas and find out the best ways to move forward with treatments. Each of these rooms not only provides the highest quality treatments, but beautiful and stately décor for a unique and comfortable experience. After being prepped and polished by the salon and beauty professionals, the $1 million handmade copper bar awaits. For this experience, back entrance access is a must. A hostess occupies the roped entryway along the beautiful, cobblestone Bridge Lane and welcomes guests directly into the lounge bar to indulge in the lavish food and drink menu. The Christopher Hanna Lounge mixologists can provide an array of handcrafted cocktails or bottle service in the working salon basin ice buckets. The lounge’s vigorous energy comes from the 1950s interior inspiration boasting faux crocodile skin wallpaper, steel handmade mirrors and velvet lounge stools and booths, all of which harmonise with the building’s original wood paneling. The lounge’s sitting area provides an exceptional atmosphere for groups, meetings, or waiting for a friend, but it is the copper bar that proves the hero feature. Handmade with real copper, the signature piece features a mixed marble bar top and artistic base and ceiling flourishes. Whether sitting on its modern barstools or merely admiring, the copper bar completes the Christopher Hanna experience. The grand salon and vaulted ceilings also make an excellent space for hair education. Each group of styling chairs and mirrors are portable to provide tailored accommodation for education and industry events. In fact the company will be hosting L’Oréal Professionnel on May 15th. “This is one of the most important heritage buildings in Sydney’s CBD and we are really very proud of what we have achieved here,” said Sam. Inspired by the original heritage features, this building has provided the Christopher Hanna team a chance to incorporate the brand’s signature style with stunning old-world charm. Now not only is Christopher Hanna a quality salon, it’s an experience.